The Tamworth Country Music Festival almost always includes Australia Day, 26 January, and it’s arguable that there’s no one more appropriate to headline an Australia Day show than Lee Kernaghan. No one can doubt that Lee loves his homeland and he finds ways to show it, whether it’s raising money to support farmers doing it tough or encouraging young Australian country music artists. At this year’s festival Lee is putting on a special Boys from the Bush 25th Anniversay Show at 8.15 p.m on the 26th, at the TRECC. I chatted to Lee towards the end of 2016 to find out what he has planned. What does Tamworth mean to you, both the town and the festival? It’s an amazing town because it gave birth to my music career. I first turned up in Tamworth in 1978, at the CCMA Talent Quest. I won best new artist under 14 years of age. And through the years I was lucky enough to win the Star Maker and pick up my very first Golden Guitar at the Country Music Awards in January 1993. So I really owe that town a whole heap. When you were in that under-14 competition, was that something you’d always wanted to do – you were a really little kid working up to it – or did you just decide to do it at the time? I think country music has been in my blood, part of my DNA. I was born with it. It had always been my dream to go to Tamworth and these days I get there and get to play some of the great venues in town, and it really has given birth to careers of people like Keith Urban, James Blundell, Kasey Chambers, Troy Cassar-Daley, and we’re all really, truly grateful for what the town has done for us. Given that you play in so many different places – and you play so much, full stop – do you have a special feeling about playing in Tamworth or is the same sort of show as elsewhere? It’s always extra special and it’s because of those people who travel from all around Australia to be there, to share in the music. Or they might be there to try to break into the music industry – it might be busking down there on Peel Street or entering one of the talent quests, like Star Maker. There’s just so much excitement around the town. You get down there on Peel Street during the country music festival and the atmosphere is electric. Mind you, I’d think it’s hard for you to walk down Peel Street without it taking about five hours to get from one end to the next. Well, I don’t mind because I made my very first film clip in Peel Street, for ‘Boys from the Bush’, and I’m going back there in January and I’m going to make another film clip because it’s the 25thanniversary of The Outback Club[album]. We’ve also got a big concert on at the TRECC on Australia Day to launch the 25th anniversary tour. The Australia Day slot is a pretty special one to have at the festival and this year you have it. Given that it’s 25th anniversary, and it’s that special day, what’s going to be different about this show? It’s going to be different because a meeting has been called of the Outback Club and they are coming in from all over the place for this one. We’re going to be playing a lot of hits, of course, but I’m also going to be playing a lot of brand new songs that I’ve been working on in the studio with some of my heroes and mates and legends in Australian music, and we’re going to start unleashing some material on that crowd on Australia Day. Are the Wolfe Brothers going to be with you? I can’t confirm or deny [laughs]. I’m under strict instructions, I’ve got to keep the lid on all of that. That’s right. There’s leaks everywhere [laughs]. I love those boys and I love working with them and playing live is an awesome experience. You’re very good complementary acts because you have incredible work ethics and you really understand audience and communicating with audience. I remember seeing the Wolfe Brothers for the first time on Australia’s Got Talent and they just blew me away. A couple of months after seeing them on TV I ended up in a rehearsal studio with the boys, having a bit of a jam session. At that time they all had day jobs and I said, ‘Fellas, how would you feel about giving up those day jobs and coming out on tour with me?’ They jumped at the opportunity and we hit the road. And, of course, they haven’t looked back and you roll on and get bigger and bigger as the years go on. It’s been a long time – you were there as a teenager, it’s been 25 years since ‘Boys from the Bush’, and this is a job that’s quite demanding. It’s physically demanding; it can be quite emotionally and creatively demanding. What motivates you to continue every day and every year? The after-show parties [laughs]. I was reminiscing about the early days, back in 1992. I was on tour with James Blundell, in his band and I was his opening artist. Out there on that tour, every day would be a new town and another motel room and another big party. And we partied like there was no tomorrow – and the reason why we did that was that we thought, This is too good to be true – this can’t last [laughs]. But it did and it’s been 25 years now. I don’t for a second believe that you indulge in too much partying because you’d have to be fit to keep up your pace. Oh yeah, you gotta be in training, mate [laughs]. Don’t want to come into this undertrained. You’ve got to turn up, shut up and get into it. Have you found that the shape of your audience has changed? Are they growing up with you, or older with you, as the case may be? Or do you see a lot of younger people coming into your shows? It’s really been amazing me throughout the last two and a half decades how the audience keeps regenerating. There’s a lot of kids who get into it and I think that’s probably why ‘Boys from the Bush’ and The Outback Club impacted the way it did, because it was about a younger generation of Australians living and working on the land. And they’re still out there today and still coming along to the shows but so are their mums and dads and their grandparents. It’s a great privilege to play to all these people and I absolutely don’t think of them as fans at all, they seem to me to be more like my extended family. I really believe that they feel that in return for you. The country music audience is accepting of a whole lot of different and new artists but I think their requirement is authenticity and connection, and for people to turn up for you year after year they really feel that connection strongly. That’s so true, Sophie. It comes down to being real and I think that [in] the country music fraternity there’s a great level of camaraderie between the artists and, of course, their fans. It’s a great relationship. Country music, the way I see it, it’s the music of our people, our country, our way of life. It’s all about the things that make us tick, and that’s what makes it real for me. I’m sure there are people who talk to you who might have a song idea or something they’d like you to write about, do you feel that the stories or, perhaps, concerns of your audience are changing? With songs, you just never know where the next one’s going to come from. Often it’s in a chance meeting, a turn of phrase, rolling into a country town for the first time. It’s hard to really pin it down, where they come from. But I know that a song is only ever as strong as the idea behind it. And I think great songs are things you don’t actually manufacture in a songwriting workshop – it’s more about getting out there and living life, experiencing it first hand and talking to people, and I know that’s where most of my material comes from. It’s probably impossible for you to pick a favourite song – but do you have one, or do you have a handful of favourites? Songs, when you record them and you put them out on a record it’s like giving birth to a child and it’s hard to pick favourites amongst your own kids [laughs]. But ‘Boys from the Bush’ was the one that kicked down the doors and paved the way for me, so it’s a song I’ve sung thousands of times and never ever once got sick of performing it. As an audience member I’ve often wondered how artists play the same songs over and over again, but I guess the crowd is new each time and the venue’s new, and you just never know who you’re singing that song for on that particular night. That’s true. You share the song with the country, with the people – it’s ours. They all mean different things to different people. I know that there are certain songs that I was listening to when I was falling in love for the first time or breaking up with a girl, rolling on a mission on the Newell Highway in a 1978 Ford Cortina with a broken windscreen and I know I was listening to Hank Williams, Jr on my Craig stereo system. I had a broken heart and a broken windscreen. I think Trisha Yearwood did it best when she recorded that beautiful track ‘The Song Remembers When’. Is there a venue or a town you haven’t played in yet that you would really like to? Yes – Birdsville. I’ve played up in Birdsville [laughs] but I haven’t physically done a gig there. In July I’m going to be the Big Red Bash and it’s the most remote music festival in Australia and I’m going to joined by James Blundell, Troy Cassar-Daley, the McClymonts and a bunch of legends for this incredible event. Finally: you’re well known for your charity work and supporting a lot of different causes. Is there anything you’re working with at the moment that you’d like to mention? I’m a bit supporter of the McGrath Foundation, inspired by the Burrumbuttock Hay Runners – they did a terrific job getting feed to stock in drought-stricken Queensland. I’ve just returned from Western Queensland where it’s green, really green out there – it’s unusual to see it. There’s a lot more optimism there now than what there was a year ago. Probably the highlight of my career has been the Toyota Pass the Hat Around Australia concerts because every dollar that was raised in the town stayed in the town. No costs came out of it – it was all for the towns, and that’s how a couple of million dollars was raised for community causes around Australia and that’s something that’s still very close to my heart, and I think most people in Australia – whether you’re in the music industry or not – the Australian way is to look out for a mate who’s doing it tough. Whether it’s a drought, flood or a bushfire or an important community cause, when things are tough in Australia, Australians pass the hat around and they do look after their mates. Lee Kernaghan plays the TRECC on 26 January as part of the 2017 Tamworth Country Music Festival. Tickets here. No doubt someone has called Lee Kernaghan ‘the hardest-working man in country music’ – and that would be because it’s true. He’s on tour now with undoubtedly the hardest-working band in country music, the Wolfe Brothers, bringing The Songs & The Stories to towns around Australia. I spoke to Lee a few days ago about his epic end to 2015. Lee, I’m worried that you’re not working hard enough. [laughs] It’s a labour of love. I’m lovin’ it. And it’s a massive tour – you’re going all over the place. This is what you do – you tour a lot – but I’m really curious as to how you keep your energy levels up. I’ve got a few secrets. I take the Ab Roller out – work on the abs. I go to the gym as much as I can. I have a detox that I take – wellness greens and vitamin C, fibre. I have that every morning. I just try to eat good food as much as I can, drink as much water as I can. And a bit of Fireball whisky to wash it all down at night. [laughs] And how about your voice? I know some of the advice to singers is ‘don’t talk the day of a gig’ but you’re doing media and all sorts of things. How do you protect your voice? I try not to do a whole lot of interviews on the day of the gig, so just relax it a bit. And that Fireball whisky does work wonders on the vocal cords. In this show you’re doing an acoustic first half, so that puts your voice even more on show. This is the first time you’ve done acoustic on a tour like this, so what prompted that decision? To do something that I haven’t done before. And this whole show really has been a perfect example of heading into the great unknown. I’ve never been as nervous as I was before the first show in Townsville just last week. I had no idea how people would react to the show but it became very evident very fast that we were all a part of something much bigger than us, and it’s been an absolute privilege and an honour to bring these songs and stories to life on stage. The first half is songs from albums you’ve done that aren’t Spirit of the Anzacs and the second half is Anzacssongs. How do you choose a set list, given that your career has been so extensive? We just have a bit of a yarn, the boys in the band and I. We knocked it around. We rehearsed for a couple of weeks and then decided which ones we wanted to do live. It’s unplugged and semi-acoustic so the boys all bunch up close together on stage and I’m loving that part of the show. It’s a lot of fun. Christie Lamb joins us as well, singing harmony vocals, mandolin – she’s a brilliant piano player, acoustic guitar player. She stars in the second half of the show as well, doing some solo songs. We’ve also got Jon English’s son – the great rock legend Jon English. His son Jonathan English is in the band. So it’s a brilliant bunch of musicians. And how are those Wolfe Brothers coping with acoustic? I don’t think they’ve ever sounded better. It really showcases the boys’ vocals and their musical ability and musicianship. They’re knocking it out of the park. They’ve possibly surprised themselves with that, because they’re so used to playing loud. That’s right. We all have. Even for me, I [usually] strap up, turn on and go. And there is that element in the show as well, but there’s a whole lot more to it. It would be really easy for someone in your position, Lee, to think, What I’ve been doing has been working well so far – I’ll just keep doing it, and you talked about being nervous before that Townsville show. But I get the feeling that you like challenges – you like to keep moving forward as an artist, and that relentless curiosity about what’s next is partly what keeps your audience moving with you. I think that this show, the fact that everyone involved in it was challenged to take it to the next level, it’s opened up some new doors and set a new template for how I will tour in the future. Using the screen and the theatrical lighting is definitely something I want to continue doing. And what about the acoustic part of it – will you incorporate more of that in future? Yes, I really do enjoy getting out there and doing it in that mode. It’s fun and it’s different, but I love plugging in electric and the bigger production stuff that comes in the second half. How long is this show? It’s about two and a half hours. The show starts at 8 and ends about 10.30 with a 20-minute intermission. The reason why I ask is so that people don’t look at the ticket time and think they can stroll in late because the show doesn’t start right then – as can happen! No, the quality’s on from the word go. There’s no filler [laughs]. Do you keep going back to the same venues on these tours or do you try to pick some different towns? My management company generally chooses which towns and venues to play. We are limited – we need to have certain capacities in order to cover the cost of taking a production of this size into a town. That’s how it works, although sometimes I think they just stand in front of a map of Australia and throw darts and say, ‘Okay, we’ll do that’ [laughs]. Spirit of the Anzacs is out now. In this year commemorating the centenary of the ANZAC landing at Gallipoli, there are many projects which seek to honour Australian soldiers and cover the history of that time, and of our diggers since. So I’ll be honest and say it was with a degree of scepticism that I approached Lee Kernaghan’s latest album, Spirit of the Anzacs. The lyrics of the album are mostly drawn from letters in the archive of the Australian War Memorial in Canberra; these were then set to music by Lee and his co-writers. For an artist as established and well known as Lee, this album could have been a risk: it’s not like his others, so there was no guarantee that his fans would like it. He’d also recorded it in amongst a very long touring schedule. The result is a very impressive, emotional album that actually has as much to say through its music as its words, and Lee has not only created something meaningful but contributed something original to our understanding of the Australian experience of war. It was my honour to talk about the album with Lee recently, on the day he announced that Spirit of the Anzacs will tour as a show around Australia. I wasn’t expecting to be as moved by this album as I was – it’s an extraordinary piece of work. When did you first conceive of the project? It was the day that I went to the [Australian] War Memorial in July 2013 – I was on tour with the Wolfe Brothers in Canberra – and as I walked in I noticed a plaque with an inscription from the founder of the War Memorial, a man by the name of Charles Bean. And on the plaque it said, Here is their spirit in the heart of the land they loved and here we guard the record that they themselves made. And those words put the goosebumps up my arms and set me on some kind of a mission to learn as much as I could about the history of the Anzacs from Gallipoli right through to Afghanistan. I’ve interviewed a couple of members of the Wolfe Brothers over the past year and a bit, so I know how much touring they’ve been doing with you – so therefore I know how much touring you’ve been doing – that’s a heavy workload. And in amongst that, how on earth did you pull this project together? Oh well, we’ve just been going nonstop, particularly the last eighteen months. It’s been a labour of love and it’s taken an enormous amount of research and we’ve had a lot of assistance from the Australian War Memorial – their historical department – and they’ve been through every word of every song and every word of every liner note to ensure its authenticity. To go into that vast archive of letters they have is one thing – and to get their permission is amazing – but then to be able to choose the letters that you’ve chosen, that must have been quite a daunting task as well as a time-consuming one. Look, I think it was the songwriter in me, when I saw words on paper and these weren’t just any words, these were the voices of the diggers on the frontline, landing on Gallipoli and on the trenches of the Western Front and the desert mountains of Afghanistan – I could almost hear the music as I read the letters. Was that the way you choose – if you could hear the music – or was there some other element to those letters that appealed to you? I could have done a hundred of them, really – they all deserved it – but we had to be mindful that we had a lot of ground to cover from the landing at Gallipoli to the Western Front, Beersheba, Passchendaele, through to World War II, the bombing of Darwin, Kokoda, all the way through to the Korean War, Vietnam, Afghanistan, and all the while it was important to us that we recognise the Army, the Air Force and the Navy. So that kind of determined what we could and couldn’t do as well. You also represented the families – because they’re letters back home, they involve the family members of those diggers, so there’s that very human, home-side aspect to those stories. One of the songs that almost takes my breath away is called ‘Song for Grace’, and it was written by Ted Egan and performed by Sara Storer. It tells the story of a young thirteen-year-old girl saying goodbye to her brothers Martin, Robert and Jack as they depart for the First World War. I called Ted up in the Northern Territory and I asked for his permission for us to record the song on the album, which he gave us, but I also asked if ‘Song for Grace’ was a true story and he said, ‘My word it’s a true story’. I said, ‘Ted, who was Grace in the story?’ and he said, ‘Lee, Grace was my mother. Martin, Robert and Jack were my uncles’. Then it’s a very fitting inclusion on this album. And also fitting that another Territory artist, Sara Storer, recorded it. Yes, and she did a beautiful version of it. I think it had to be somebody who’d grown up on the land in order to really interpret it the way that she’s done it, so powerfully. You mentioned earlier how the songwriter in you responded to some of these letters, and this is a really unusual creative project in that you have to take someone else’s heartfelt words and then translate them to music, as opposed to your own lyrics, which you’ve done many times. So as a songwriter, how did that process even start for you? Well, it was like most songwriting sessions, getting together with my co-writers Garth Porter and Colin Buchanan, and we knew that we had a very important job to do – a veryimportant job to do – because singing the voice of the Australian soldier is something that you just don’t take lightly, you have to take it very seriously with a great amount of care and respect. So I always found that the bar was just set so high with these songs, and even when I was recording the vocals I’d do what I thought was a good vocal and then I’d listen back to it and a few weeks later I’d want to re-record it because [I thought] I’ve just got to do better than that. It’s clear on the album that you felt not just the emotion of those words but the importance of conveying them too. Recording your own songs obviously has emotion attached to it but recording these songs, it sounded not like you had a heavy heart but that you really felt the weight of that responsibility. That’s right, and it was kind of putting yourself in that position of what were the diggers thinking, you know, when they were on board HMAS Armidale bound for Betano Bay out of Darwin and the enemy planes began to attack. That sense of what they must have been experiencing was definitely pretty pervasive in the recording process. That’s why I just had to keep going back and going back. I was driving everybody crazy along the way but I wanted to make it as good as it could be. Did you feel a bit exhausted at the end of the process? [Laughs] Yep, I reckon. Duncan Toombs, who did the video, worked nineteen hours straight – and this is after a week of editing – and I was riding shotgun with him through most of those nineteen hours, and when the video was completed it was about 3 a.m. and I just went to bed, turned off the lights and I put my head on the pillow and tears just fell out of my eyes. It was just the sheer emotion of it all. I think you can hear that on the album in a very good way – it’s part of why I found the album so moving, I think, what I heard in your voice. The lyrics are obviously really powerful but for you as a singer to be able to convey them that way is a huge achievement. Thanks for that … All I wanted to do on this is just properly honour then men and women who’ve served, past and present, and just getting it right for them has been the main objective, from beginning to end. You have some musical collaborators with you – you’ve borne most of the work in terms of the recording but you do have some collaborators on the album, and one of them is Lisa McCune, who’s going with you on the road for the show. How did you choose the people who appear on the album? It was just a matter of thinking who’d be most suited to some of those songs. ‘Kokoda’ involves John Schumann from Redgum – he gave me a singing lesson, let me tell ya. That’s one of those songs that I thought I’d done a fairly good vocal on and he came in and did the duet parts and blew me out of the water. So I had to go back in and [laughs] try to do better. Lisa McCune obviously is part of the show and it will be a really special moment singing that song, ‘The Unbearable Price of War’, with her in stage show. I also saw on the annoucement of the tour that the Wolfe Brothers were with you in the photo so I’m presuming they’re back out on the road with you. They are involved in the production and it’s going to be great to continue to tour with these boys – they are the hottest band in the land and lots of people would agree with me now. Taking these songs on the road in the show is a different format to playing a gig as you would normally, and I’m wondering if you think you’ll see your fans there, or do you think there’ll be some different people who show up? I think it will be pretty well across-the-board appeal, from young kids through to old people like me [laughs]. It’s country music but it’s also the music of our country, and probably more so than anything I’ve ever done before in my career. And in that career you’ve spent a lot of time on and brought a lot of attention to causes that really needed attention – I’m think particularly of Australian farmers [and drought relief]. With this project you’re bringing attention to Legacy and to Soldier On. I was wondering where that – it’s not social activism, per se, but there’s obviously a real drive in you to try to highlight these causes and these organisations. Is that something you’ve had all your life? I think it’s just a part of growing up in the country. Anybody who’s done that has a pretty keen sense of what it means to pass the hat around. I’ve been blessed with an incredible career, so being able to give back is a really important part of it for me. It’s always been that way and it always will be. You’re performing this show for a while – in fact, it seems like it will take quite a few months – and then I would imagine you’ll go back to your normal kind of show and your normal kind of set. Do you think you’ll be able to let these songs go, or will they become part of your set? Oh well, that’s up to the people out there who come to the shows, and which ones they want to hear – I’ll just keep playing the ones they want to hear. I think some will stand the test of time – I’m sure many of these new ones will. It’s probably like choosing amongst children, but are there any songs on this album that are your favourites? I love ‘I Will Always Be With You’ – it tears my heart out. It’s about Private Benjamin Chuck, 2nd Commando Regiment with Special Operations Task Group. He was on his third deployment in Afghanistan in 2010 when he lost his life in Black Hawk helicopter crash. He was twenty-seven years old; he was from Yungaburra in the Atherton Tablelands and he was one of the most elite soldiers Australia has ever produced. An incredible man and a huge loss. Such was the perilous situation that Ben and his fellow soldiers were placed in over there that they were all encouraged to have a sealed letter that only gets sent home in the event of their death. The letter that Ben wrote back to his partner forms the basis and much of the words that you hear in the song ‘I Will Always Be With You’. Spirit of the Anzacs is out now through ABC Music/Universal. It’s doubtful that there’s a country music fan alive in this country who doesn’t know who Lee Kernaghan is. So it was my great pleasure to interview this living legend – and former Australian of the Year – ahead of his new tour, which kicks off on 16 March and is in support of his album Beautiful Noise. The interview looked like it wasn’t going to happen at one point when Lee’s phone line was down due to road works near his home. But he hastily rescheduled and it was able to happen – which means I got to find out first hand just how his passion for music – and life – and his dedication to his work has taken him to the heights of success. After so many shows and tours, are you just as keen to get on the road now, as you ever were? Absolutely. It’s great to be able to go out – [there have been] 31 number ones over the last 20 years of recording. So being able to play songs that people know and love, it’s not hard work. It’s a lot of fun. And to make it even better, we’ve got this new album, Beautiful Noise, and new songs like ‘Ute Me’ and ‘It’s Only Country’ and ‘Flying with the King’, new material to play and that always keeps it new and exciting as well. You wouldn’t be able to fit 31 number one songs in an evening set though would you? So I rely on Facebook before I head out on tour. [I ask] What are the songs that you really want to hear? And my band, the Wolfe Brothers, have learnt everything; they can play any song I’ve ever recorded. So we can work off the cuff as well. So are the Wolfe Brothers actually going to be playing as your band as well as your support? Yeah, they are the support and then we play together. I saw them on Australia’s Got Talent; they blew me away with their awesome talent and songs. We ended up catching up in Sydney. The first time I met them was at a recording studio in Sydney and we just got together and jammed and played songs. Everything just felt so great that we thought let’s hit the road together as a team in 2013. And given that you have a lot of songs that people will know and you’re relying on Facebook to help you choose a set list, it must then be quite hard to decide which songs off the new album get put in the set. That’s right. And you actually have to go out on the road and tour it to find out what’s resonating; you know, what people really want to hear. So we’ll be trying a whole lot of different things and some will work and some will fail. You know, we’ll find out first hand pretty soon what the reaction is to this record. You’re starting the tour at the Dowerin Rodeo in WA. So I was wondering what it’s like playing at an event like that as compared to, say, Penrith Panthers in Sydney? Probably more alcohol. [Laughs]. More cowboys, more Driza-bones, but I love the big outdoor shows so they’re always great. It’s also good to get into that kind of intimate concert setting as well. I don’t do the same show everywhere I go. In a more of a concert – say, Twin Towns – it’s much more of a concert setting. So as opposed to the Eatons Hill Hotel, which is the biggest pub in the Southern Hemisphere, and that would be just a party town tour that one – a party town show. You’ve done so many shows now that I’m pretty confident that you’re aware of all of the technicalities of it, so from a technical standpoint it must be challenging for those big outdoor shows for you to make sure your sounds right, that it’s getting out to the people who are right at the back of the paddock. Yeah, well, you’ve got to have pretty good production specs so that you can guarantee people are going to get good sound. And the show is never just about me, it’s about the people that you have around you. You know, that great band, the crew, the sound, the lighting, there’s so many people involved in it; there’s about 35 people on the road and they all work really hard to sort of bring it together on the night and make sure people get something that sounds great and will be a memorable experience. And this would be quite a contrast to how you first toured, which was with a horse float full of your gear, so I was wondering, first of all, if you still have the horse float and second, because I think you were touring like that on your own for quite a while, what kept you going during those years? The need to make the next payment on my car, [laughs]. [Laughs] That’s a good motive. Yeah. Just trying to survive and by about 1991, I’d pretty well given up on music. I’d been doing it for 15 years and I was broke. I was dejected and I was, yeah, a broken unit. The only thing that saved me was a song called ‘Boys from the Bush’ and an album called Outback Club, which I started recording in 1991, and that really was the rebirth of me as a recording artist. It would be tempting to say, oh well, the one song and that’s where the success came from, but those years on the road and connecting with people and smaller gigs, I tend to think that sort of work does pay off. Even though you’re not aware of your audience building, it reaches a tipping point ,if you will, so if you put out that song, put out that album, the people are out there; it’s just that suddenly they all make themselves known. Yeah, yeah. Well, winning three Golden Guitars on the Outback Club and an Aria helped kick it along out there in Australia. And Three Chain Road triple platinum, Aria, and things were just exploding. I spent 10 years just playing nearly every night; we just toured so hard to the point that I reckon by the time I finished touring the 1959 album, I was a burnt-out unit. I remember playing Gatton and somebody wrote in and said, “Lee Kernaghan, it looks like he’s on drugs or he’s drunk.” But I was just jet lagged. Coming back from America, I was just completely burnt out from the road and I think it was around that time that I thought I’ve got to be a bit smarter how I tour or I’m not going to make it. That was the end of the ‘90s. And I took a bit of time off – I think I took a year off at the beginning of the next decade and I made Electric Radio. But all the way along, the priority for me has been to make the best record I possibly could and if it took time, I prefer to take time – I blew so many deadlines but you’ve got to be able to stand by the work. You can’t disown your songs once you’ve released them; they’re yours; they’re part of the family, [laughs]. And you also can’t create on demand. It’s a real challenge for artists like you, and even artists who aren’t as successful or you or as well known as you, once you start touring, you’ve got an album out and you’ve got to write new songs; you’ve got to keep touring and they’re different parts of your brain in a way that you have to use and you can’t exactly sit down and just summon up songs when you need them. Now, how do you know all this? What’s your involvement in the music business because you know too much about it? … You nailed it, because you have to transform into – well, I find you have to transform into just being a songwriter sometimes and you just live, eat and breathe songs. And you live it; you breathe it; you dream it. You go to bed at night with a song in your head and it’s not uncommon the next morning, you know, 7 a.m. and that song’s still floating around. So you go from that phase into the let’s make a great record phase where you spend weeks, months in the studio and then you go into the phase of getting your picture taken and doing all the publicity and all the interviews. And then you move into another phase of actually hitting the road. That’s where it all comes together. You know, the touring and the concerts. That’s what makes it all worthwhile I reckon. I think also for someone who’s had your success, I wouldn’t mind betting that you’re a bit of a perfectionist and I don’t mean that in a bad way at all. It means that you want things just right for your audience, which means taking that time, but also possibly means that you could drive yourself a little bit crazy trying to get it that way. I think it’s a really delicate balance and to do it for so many years and so consistently is a huge achievement. Yeah. You’re right. You’re very intuitive; I’ve driven myself crazy and a whole lot of other people [laughs]. Yeah. As your audience has grown, is there anything you do miss about those early years when you were playing pubs to a smaller audience in a more intimate room? [Laughs] You like a big stage? Yeah. I’ve loaded in and loaded out of hundreds of venues and been the singer, the sound man, the roadie, the booking agent and everything. I’m much happier doing what I do now. Well, you kept at it for a very long time when other people would have given up, but you obviously believed it was your calling. I think it was probably in my blood, in the DNA to do it, but it’s still been a blessing to be able to have the opportunity to do it, you know. I never take a moment of it for granted. I think audiences pick up on that too. I think country music audiences, they’re really aware of what performers and singer-songwriters are like and I think if they smelled a phony, you wouldn’t get to be around for very long. Yep. I really respect my audience. I don’t like using the word “fan” because when I get out on stage, it’s more like I’m playing to just mates. Now, I just wanted to ask you a couple of questions about Beautiful Noise because you will be playing songs off the album. I read that before releasing an album, you road test songs in a Land Cruiser, so I was wondering if that means you take them for a drive and see if they’re right for singing along to on the road. [Laughs] It’s something about the sound system in the Land Cruiser that if it sounds good in there, it’s fully certified and I know it’s going to sound great wherever it’s played. There’s nothing like getting out on the road and listening to an album and I often do that when I’m figuring the song order. So it’s got that natural flow. Look, I reckon, my records have been made for the road – for travelling. And I hope when I make each one that someone somewhere will slip the CD in and do a couple a hundred Ks and enjoy the ride without really noticing that they’ve driven so far. You mentioned the audience and thinking of them as friends more than fans, and so I was wondering when you were writing songs for a new album, particularly now that you have a lot of those friends, are you conscious of writing to that audience or to their expectations? Well, Kelly Dixon, who wrote ‘Leave Him in the Long Yard’ for Slim Dusty, he said, “Son, when you do your songwriting, if you tell the truth and you keep it real, you won’t go too far wrong.” And that’s kind of always been my true north as far as how we’d go about writing a song. Much of its practical, like ‘Flying with the King’; you know, I got on that Ansett flight out of Sydney to Perth. I sat next to the king of country music and we flew across Australia together. You know, those memories they stay with you for life. If you can just write about it as simply as you can, I think it can resonate. Those sorts of stories can resonate. For me, the song that really resonated on Beautiful Noise was ‘Keeping On’ and I thought that was a really lovely tribute to the country, given that you would have travelled over so many parts of it. In terms to bring it back to the tour, instead of asking you which places you like the most to play in, I was going to ask if any journeys have been difficult? In touring. Either physically difficult, or you just thought, oh, I can’t go to this place again? Yeah. I remember the first time I played Toowoomba with Troy Cassar Daley. I was touring with Troy and the Blue Heeler band back in the early ’90s and we played a pub in Toowoomba and we got about 15 people for the gig. That was a bit of a disaster and the rooms in the hotel had broken windows [laughs], and you lay on the bed and it sort of collapses underneath you. We headed out west on that tour and the truck broke down [laughs], we had to make do with some borrowed guitars, amplifiers and some locals in town, but I think some of those harder times out on the road, the memories become a lot richer as time goes by. And you and Troy should probably never tour together again. Well, we didn’t after that. [Laughs] We just did the one tour. Well, I wouldn’t mind betting those 15 people who were in that pub are still telling the story of how they were there that night Lee Kernaghan and Troy Cassar Daley played to 15 people. Well, the thing is, they probably didn’t know who we were anyway when we were there. So they’ve probably forgotten. I think they were a very privileged audience. And I also really liked the song ‘Peace Love and Country’ and I was wondering if what country music has brought you is the other two words in that song, or the other two aspects in that song, peace and love? It’s a little bit like a hymn, that song, for me. I just love it so much and it reminds me of a little place; it’s a little shack up on the New South Wales-Queensland border up in the mountains. It just takes me back to that place where I’ve written a lot of songs over the years and there is a sense of peace and freedom when you’re up there in the bush. It’s not just about the landscape, it’s about it all makes sense when you’re with the right person. I was lucky enough to marry my soul mate. And Robbie’s been just the best wife, girlfriend, and mother that a bloke could ask for. That song I had her very much in mind when I was writing that one and I had the place up there in the hills. She was very much front and centre when it was being written. I think that’s a very good note to end on, a lovely note to end on. 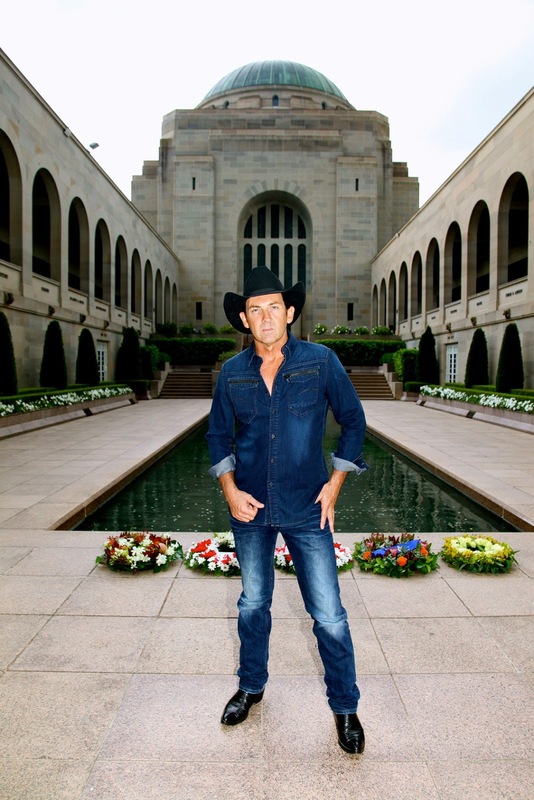 Lee Kernaghan’s tour runs from 16 March throughout most of the year across most states and territories. Visit www.leekernaghan.com for the full schedule.